The following FAQs refer specifically to VitalityHealth Recommend a friend. You can also look at the Terms and conditions. If you can't find an answer to your question, you can raise an enquiry with our customer support team. 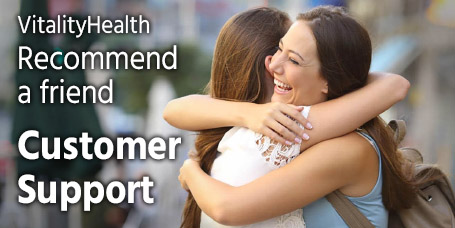 What is VitalityHealth Recommend a friend? Recommend a friend is available to our existing members only. 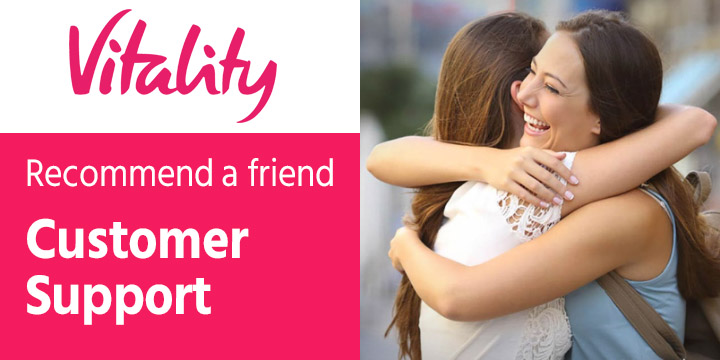 It lets you introduce your friends and family to Health Insurance from Vitality. If they use the link or code you gave them to take out a plan, we'll give both of you a John Lewis Gift Card or Amazon Gift Card. How do I recommend VitalityHealth Insurance? You need to register using the online form in the link. Once you've registered, we'll give you a unique referral link and code that you can share with your friend. Alternatively, you can give us your friend's details and send them a recommendation message and link in an email. Your friend should then use the link in the email to visit the Vitality website and take out a health insurance plan, whilst using the same device (i.e. PC or phone). Once three months have elapsed since the start date of their plan, you'll both be eligible for your rewards. When my friend takes out a plan, how will you know that it resulted from my recommendation? The link is made automatically if your friend clicks the link button in your recommendation email, clicks on the unique link URL you gave them, or uses the unique code you gave them when they call the Vitality call centre. Three months after the start date of your friend's plan, we will send both of you a reward notification email. From there, you can click through to a page where you can choose to receive your reward either online (as a PDF e-code gift card attached to an email) or offline (as a physical gift card in the post). Once you have made your choice, you will receive your reward within 30 days. Can I make a recommendation using Facebook or Twitter? Yes. As soon as you have registered, you can share your recommendation on your Facebook or Twitter account. Then, if another friend clicks on your link, follows the Terms and Conditions, and takes out a VitalityHealth plan, you’ll both get your voucher. Do I need my friend’s permission before I send them a recommendation email? Yes. You should make sure your friend agrees to be sent a recommendation email. My friend didn’t receive the recommendation email. What went wrong? There is a chance it accidentally ended up in their junk email folder. We take every measure to stop this happening, but we can’t guarantee it. Just ask your friend to check. If it isn’t there, please ask them to make sure that emails from noreply@refer.vitality.co.uk aren’t blocked and repeat the recommendation process from the start. A friend I referred took out a VitalityHealth plan, but I didn't get an email about my reward. What went wrong? If you haven’t received your notification email and more than 120 days have passed since the start date of your friend's plan, and they followed the Terms and Conditions, please contact us so we can investigate and get back to you with a response. We are unable to respond to queries about non-receipt of rewards until 120 days after the start date of your friend's plan. How is my personal data stored? How secure is it?